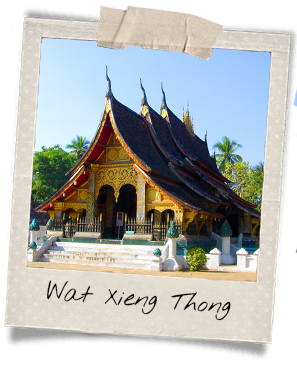 An inland waterway port situated on the Mekong and the Nam Khan Rivers, Luang Prabang is UNESCO Heritage listed. The beauty of the city is not disrupted by any modern buildings indeed; it managed to remain genuine, comprising restored colonial houses. Historical landmark, Luang Prabang seems to have stopped in time. 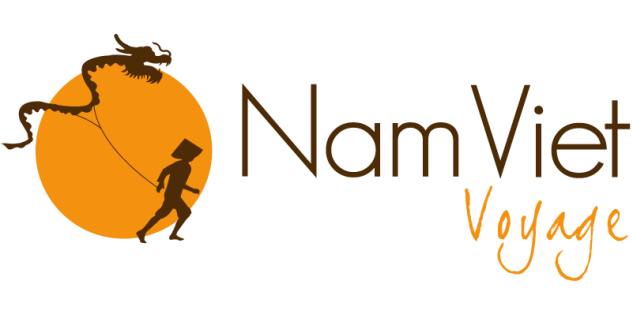 Alms giving ceremony, royal palace, waterfalls and rivers, elephant rides: there are a lot of things to do in the 3rd biggest city of Laos. 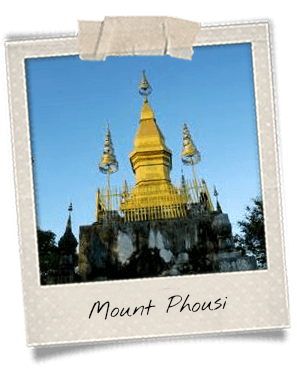 Mount Phou Si, also written Phu Si, is one of the main attractions of Luang Prabang’s city-center. It is a 100-meter hill atop which stands a 24-meter gilded stupa called That Chomsi. To reach it, you have to muster all your courage and climb the 329 steps. But once arrived at the top, you figure that the reward is worth the effort: the hill offers a sumptuous vista upon the surroundings. From dawn to dusk, landscapes are truly breathtaking. 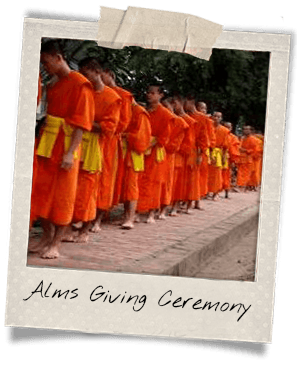 Called Tak bat in Laotian, the alms giving ceremony is an ancient tradition highly revered by the local population. Every day at the sunrise, monks from various monasteries gather and start walking in Luang Prabang’s main street before spreading out to the side streets. Holding their begging bowls, they march and are offered food from the locals. This specific ceremony ties bonds between the monks and the people. The building of the Royal Palace in Luang Prabang started in 1904 for the King Sisavang Vong. The architecture finely blends traditional Lao and French Beaux-Arts styles. In the king’s reception room can be seen paintings from French artist Alix de Fautereau. 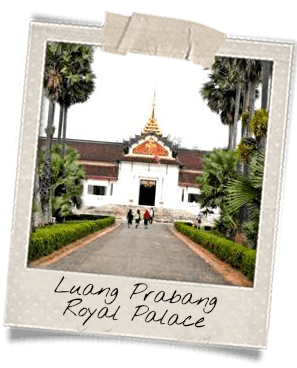 But overall, the Royal Palace houses the Pha Bang, the national treasure for which the city is named. It is a 83-centimeter gold-alloy Bouddha. The Wat Xieng Thong comprises several religious buildings. The main temple, which is called sim in Laotian, houses Buddha statues. Around this temple stand several stupas and three small chapels. One of them contains a reclining Buddha and was dubbed “the Red Chapel” by the French. Another building is a garage for the ceremonial carriage that carries the funeral urns of the Lao royalty. The complex was built in 1560 by the king Setthathirat. 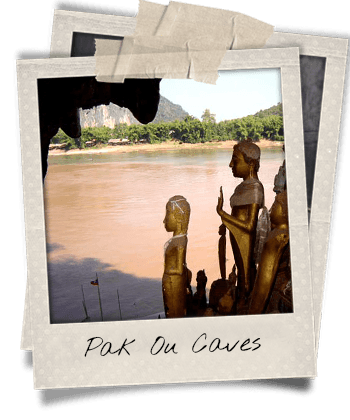 About 30 kilometers of Luang Prabang, the Pak Ou Caves actually comprise two caves: Tham Thing, the lower cave, and Tham Theung, the upper cave. They stand at the foot of limestone mountains along the Mekong River, thus they are accessible by boat. The main feature of those caves is the multiple Buddha statues cramming the inside of the caves and that have been displayed there by the believers. 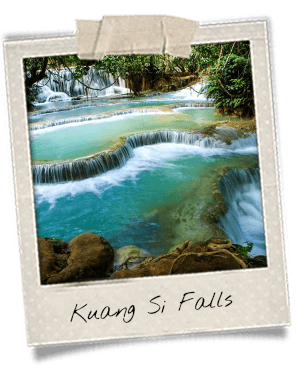 The Kuang Si Falls lie about 30 kilometers southeast of Luang Prabang, and stretch over three tiers. They are accessed by a trail, and multiple bridges and ways can be used to stroll around. The main fall consists in a 60-meter cascade. Besides, all the way down the stream, water forms natural turquoise pools in which visitors can have a swim (except one that is considered sacred).